the one and only | is there any more pie? Posted on November 2, 2015	by is there any more pie? Sammy hasn’t figure out how to be scary yet. Because he is so cute! His parents brought him to trick-or-treat Saturday night. 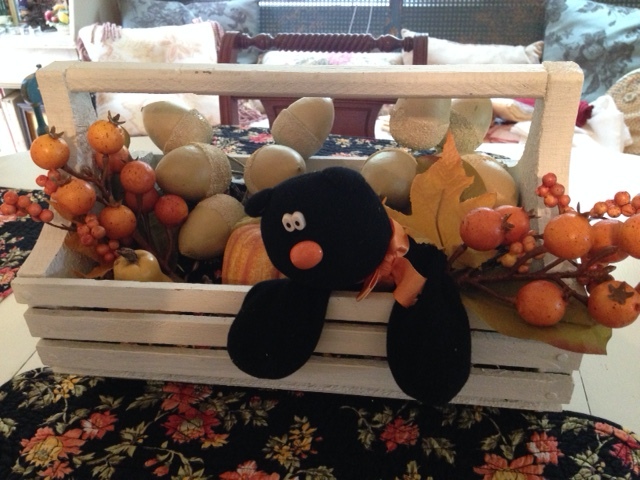 He was more interested in my Halloween decorations than acquiring candy or treats. He was our one-and-only trick-or-treater because we live in an area with very few children and we are at the end of a very dark and long driveway. Sammy likes to very patiently take things apart and put them back together again. I think he’s going to be an engineer. He sat on my lap and carefully dismantled this box. The acorns were his favorite part. 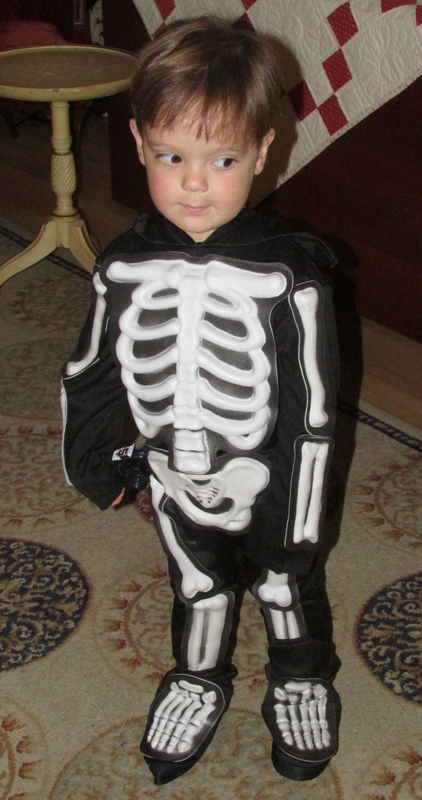 And then the “scary” skeleton accepted a cheese stick (his favorite), gave me a kiss and went on his way. This entry was posted in friends, just for fun, rhode island. Bookmark the permalink. Adorable. I love that little sideways glance. He does that a lot. So cute. What fun to have Sammy come for treats off the beaten path. It reminds me of when we would take our kids up to Om and Barbara’s. Sammy sure makes a handsome skeleton! What a sweetie!